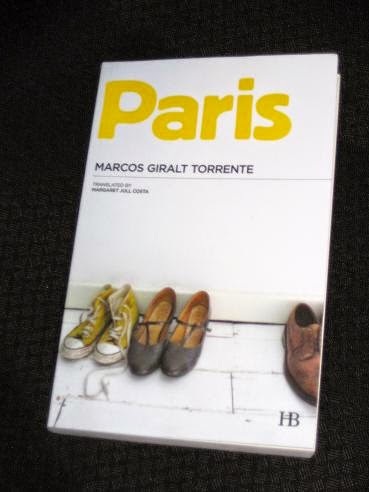 Marcos Giralt Torrente’s Paris (translated by Margaret Jull Costa, review copy courtesy of the publisher) is an excellent, psychological novel, a book which looks at the weakness of memory and the dangers of reliance on a single person in your life. It’s written in the form of a monologue told by a middle-aged man looking back to his childhood and, in particular, events surrounding his ne’er-do-well father and his enigmatic, saintly mother. Paris is intense and powerful, and the combination of great writing and an intriguing secret makes for an excellent novel. It was the unanimous winner of the 1999 Premio Herralde de Novela (a Spanish prize for debut novels), beating Andrés Neuman’s Bariloche into second place. For a first novel, it’s a surprisingly complex and developed piece of writing. However, the flip side of that is that it should come with a warning – you’ll need a lot of concentration to stick to the task at hand. The author develops his picture of the mother with a slow, steady build up of details. A controlled, measured woman who knows her man will disappoint her, she wants to believe in him, despite knowing full well that he will never change. Which rather begs the question – why does she stay with him for so long? And, more intriguingly, does she have a few more secrets of her own? As much as the novel is about the mother, though, there’s also a lot to discover about the narrator, a man searching for truth among the rubble of half-remembered events. He’s never really sure of the events he discusses, constantly talking around the facts, either because he can’t remember them or because he never knew them in the first place (in several places he explains that he was never privy to the whole truth). In fact, the same is true for the poor reader as we are strung along a little, never really knowing what, or whom, to believe. Which doesn’t stop the writer, and narrator, from trying to pin down the essence of those distant events. We are drawn into this game too, tempted to judge the characters – the mother, the father, the narrator, his Aunt Delphina. The problem is that with only a few of the facts, we can never be completely sure that we’re right. The writing is excellent, with a style reminiscent of Saramago and Marías (there are definite shades of A Heart So White here). Paris consists for the most part of long, precise sentences, full of complex clauses, constantly folding back on, and contradicting, themselves. Of course, this is all aided by the choice of translator – Jull Costa, as always, does a wonderful job, meaning that the book never reads like a translation. Before I finish, there is one little issue I want to address here. This is my third Hispabooks work, and all three have had British translators (Rosalind Harvey, Jonathan Dunne and Margaret Jull Costa). While the translations definitely feel very British, for some reason, the books use American spelling conventions, plus the occasional, jarring Americanism. It’s a trend I’d already picked up in the first two books, and reading Paris merely confirmed it. Tony, I've come close to buying the Spanish edition of this book a couple of times now over the years without having done so yet. You almost make me regret my decision! The problematic nature of the subjectivity of the narrator sounds appealing as does the novel's similarities to Marías that you touch on. Anyway, I appreciate the review–had heard lots of good things about the work but not from any bloggers I know until now. Cheers! I'm one of those who wouldn't mind the type of English used in the translation. So long as they don't mix them up in one book. I confess though I have a slight preference for the American forms; it's more familiar to me. This book is of interest especially as it tackles the workings of memory and how it's tentatively conveyed. Memory seems to be the favorite theme of the best writers. Americanisms aren't jarring for Americans, are they? I've translated for a Greek publisher of English books, and they also preferred Americanisms, which is just as arbitrary as choosing UK English. This is just as arbitrary as using British English. As for -ise and -ize, the OED prefers the latter, as did Fowler. Sorry for repeating myself in the initial post. I assume you mean they would be jarring in a British English text. I thought of that, and thought perhaps the publisher was British, which of course it's not. What we have here seems to be a Spanish publisher of English books who prefers Americanisms, but might not be familiar enough to catch all the Britishisms that slipped through the cracks. Or they might just be universal, and for that reason a type of English that people on either side of the ocean would feel comfortable with and would consider their own. The line of work I'm in (not translation) has forced me to deal with this issue many times. (I'm Canadian, actually.) I find the difference between the English used on either side of the ocean to be exaggerated. Americans tend not to be aware of a difference, tend not to think about it, because they have little exposure to British English. When they do come across it, they just scratch their heads and wonder why you speak funny. On the British side, people seem acutely aware of the difference, even defensively so, to the point of seeing differences where they often don't exist. My impression is that in Britain, the preserve with fruit pieces in it is also called jam and that people generally don't go for the more gelatinous version. If they do, I don't know what they call it. You'll have to clarify this for me. anatomyofmelancholy – As you point out, the British do tend to be more aware than Americans of the linguistic differences – which says something in itself… You're quite right with what you say about the publisher, but I suspect that as much as this has to do with not being expert users of American English (from memory, these books do have American-English-speaking editors or copy-readers at some point in the process), it is more about British translators pushing back and not allowing too much of an Americanisation of the text. At least, this is the impression I got from talking to the publisher. British readers notice unexpected American editorial substitutions in an otherwise familiar-feeling text, and if the case were reversed and an American translator's work was edited to use British English words (changing sidewalk to pavement and so on) American readers would find it just as incongruous. Spelling is one thing (although changing mum to mom would definitely change the feel), but attempting to change words is always messy. This kind of editing can only really pick up words and short phrases but not sentence construction and so on–the water that the translator is swimming in, so to speak. I dislike books that have this kind of inconsistency, because in reality a huge number of sentences would come out completely differently if a UK and a US translator started from scratch with the same source text. As an English person living in Canada I notice huge differences–not at all differences that lead to misunderstanding, but basic things like “how are you?” versus “are you all right?” (ok, people in the UK do sometimes say “how are you?' but I didn't hear it until my twenties; whether it's a regional thing or a change over time I couldn't say). To go back to the swimming analogy, if you can swim you can swim anywhere while noticing interesting differences in the water without your enjoyment of swimming (or ability to swim) being affected. But if a school of fish from a geographically distant location came swimming by, you'd think it was extremely odd. So readers from all over can happily read a translation that is consistent in its language (language being something much bigger than individual words) but if something doesn't fit it stands out and jars. If you're reading a book that is in your own English but with seemingly random words edited to supposedly fit another English, you will notice that much more than if you read a book in another English with the random words edited to more closely match what you expect.